“Holy unanticipated occurrences! A cynic meets an unlikely superhero in a genre-breaking new novel by master storyteller Kate DiCamillo. It begins, as the best superhero stories do, with a tragic accident that has unexpected consequences. The squirrel never saw the vacuum cleaner coming, but self-described cynic Flora Belle Buckman, who has read every issue of the comic book Terrible Things Can Happen to You!, is the just the right person to step in and save him. What neither can predict is that Ulysses (the squirrel) has been born anew, with powers of strength, flight, and misspelled poetry—and that Flora will be changed too, as she discovers the possibility of hope and the promise of a capacious heart. 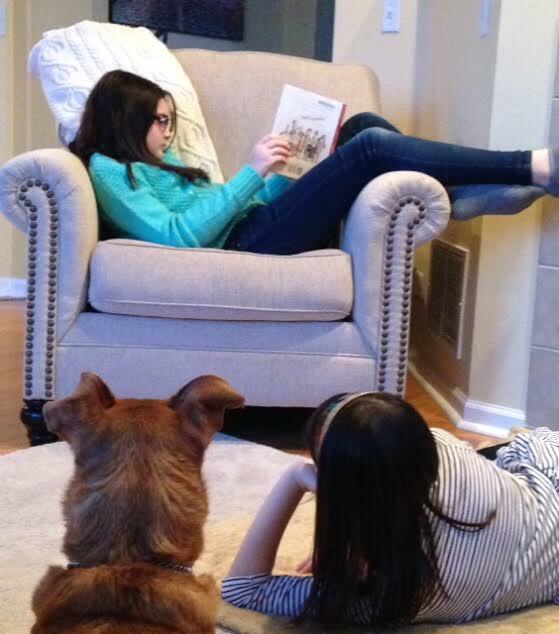 Even the dog was enjoying our book club pick! Maybe because there was a squirrel? What a fantastic story for a children’s book club. The mixture of illustrations really set the story apart from other chapter books. Kate DiCamillo understands her audience combining heartfelt family issues with the love and companionship of animals. Have a dictionary/thesaurus ready for there were many challenging words that even had me stumped. We played a game trying to decode the unknown words with context clues, but to be honest, some were difficult. Being a small book club (three people) it was easy to pass the book around to share illustrations and take turns reading. For a classroom setting, I would encourage multiple copies or use technology like an ELMO or overhead to engage larger audiences. Regardless, I would visit the above study/discussion links for further activities which are very useful. 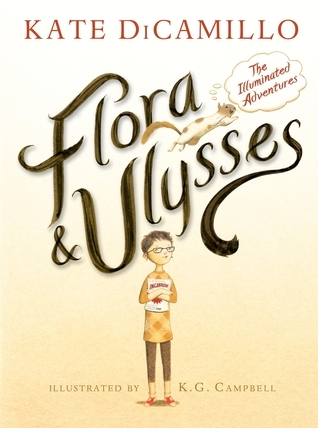 There is no doubt why Flora & Ulysses won the 2014 Newberry Medal. Tags: 2014 Newberry Medal winner, Animals, Children's Book CLub, Children's Literature, classroom chapter books, family, fantasy, humor, Kate DiCamillo. Bookmark the permalink.